This delicious cooked-fruit recipe is like cobbler without the cake. And boy-howdy does it taste good with ice cream! In a bowl, toss together peach slices and lemon juice. In a slow cooker, combine brown sugar, butter, cream, and cinnamon; mix well. Add peach slices and toss to coat with sugar mixture. Cover and cook on low for 4 to 6 hours until fruit is bubbling. If desired, serve over vanilla ice cream. 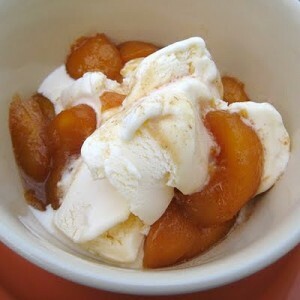 Sliced apples can be substituted for peaches.